RegenaLife's Whole Body Detoxifier contains Zeolite. Zeolite is a volcanic mineral with a selective molecular trap able to carry harmful toxic substances out of the body via normal excretion processes without interacting with body tissue. This lack of interaction reduces the chance of unwanted side effects. The selective elimination of harmful substances leaves the body with more energy for physical performance and regenerative processes. The result is optimized performance and wellness through detoxification, entirely naturally! A modern lifestyle exposes our bodies to a huge amount of harmful influences on a daily basis; environmental pollutants, an unhealthy diet, alcohol and tobacco, medications, infections, heavy metals and radioactive cations, pesticides, acidic metabolic waste products and stress, just to name a few! We normally assume that our bodies are able to deal with all this stress, at least up to the point at which signs like poor performance, premature aging and illness indicate quite the contrary. In order to counteract such processes, it is advisable to assist the body with detoxifying, cleansing and regenerating on a regular basis. Taking RegenaLife's Whole Body Detoxifier is a simple, affordable and effective way to do so! Ion-exchange capability: Toxic heavy metals such as lead, cadmium or cesium bond with Zeolite and are flushed out; in return, the body receives beneficial ions such as magnesium or calcium. Adsorptive and detoxifying effect: Zeolite is capable of bonding with a whole range of unwanted substances, including acidic metabolic waste products and bacterial toxins. The body is relieved of waste products and can use more of its energy for regenerative processes. Antioxidant properties: Free radicals build up in our bodies through metabolic processes, a poor diet, prescription drugs, environmental influences, etc. This paves the way for countless degenerative diseases to thrive. Zeolite binds with and eliminates free radicals, while preventing new ones from forming. Zeolite assists in recovery after chemo or radiation therapy. 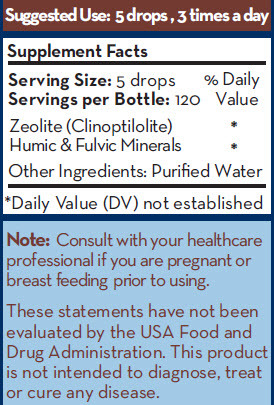 Zeolite Ingredients: Zeolite (Clinoptilolite), Humic and Fulvic Minerals, in a base of Purified Water. Zeolite Suggested Dosage: 5 drops, 3 times daily.